Featuring: Jimmy Stewart, Shelley Winters, Dan Duryea, Tony Curtis, Rock Hudson. Director: Anthony Mann. Warning: This movie is only supposed to be available for streaming until Dec 29th. Act fast! As some of you may know, Jimmy Stewart is one of my favorite actors of all time. He had a presence like none other and had more acting chops than I think a lot of people give him credit for. They think of him just as sweet George Bailey and forget how many diverse roles he was in. However, until a couple of westerns showed up on Netflix streaming, I had never, ever pictured Jimmy Stewart being in a western. It just seemed like a strange fit that would never work. Then I saw Destry Rides Again and realized it could work very well in a western with a lighter tone. Winchester '73, however, has a much more serious tone. 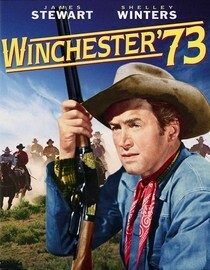 Jimmy Stewart plays a man who likes guns and is out for revenge. I kept thinking of George Bailey. I couldn't help it. Stewart gave a good performance, the supporting cast was excellent and the story was decent. I just couldn't get past the fact that Mr. Mr. Smith Goes to Washington was determined to murder someone. That's just my own bias though. This is a solid western, and if you enjoy the genre I recommend it. Just don't spend the whole time wondering if a devil gets his horns every time you hear a gunshot and you'll enjoy it more than I did. According to Netflix this movie will stop streaming on 12/29/11. Of course, sometimes they lie. Why is it in your queue? Jimmy Stewart. What stood out the most to you? Jimmy Stewart being driven by revenge. What mood should I be in to watch this movie? Looking to get your western fix.